Net profit of EUR 1.6 million, compared to a loss of EUR 23.6 million in 2015. Revenues down by 6.9% to EUR 421.0 million, mainly due to lower advertising revenues from print media (2015: -6.8%). Envisaged cost measures on schedule. EBITDA improved to EUR 9.0 million (2015: EUR 7.7 million). EBITDA excluding restructuring charges falls to EUR 22.0 million (2015: EUR 34.7 million). The strategic partnership with Talpa (Sky Radio Group) results in book profit of EUR 4.3 million. The conversion from print to digital use of content continues unabated. This trend translates into a further decline in the advertising and subscription revenues from print. The revenues from combi-subscriptions and digital subscriptions are on the rise. Advertising revenues from print have decreased, affected by the negative development in the Dutch print advertising market. Total revenues, including normalisations, amounted to € 421.0 million (2015: € 452.4 million). Due to various product rationalisations, cost savings and a decline in the costs of permanent staff (the effect of the reorganisations that were implemented), costs excluding restructuring charges show a strong decline of € 18.7 million. This means TMG is on schedule in achieving its cost reduction target of € 90 million in 2019 compared to 2015, excluding the effect of cost increases due to new initiatives. This eventually resulted in EBITDA of € 9.0 million, compared to € 7.7 million in 2015. Excluding restructuring charges, EBITDA decreased from € 34.7 million to € 22.0 million. The result for the year improved strongly from a loss of € 23.6 million in 2015 to a profit of €1.6 million in 2016 due to lower restructuring charges and impairment of non-current assets, a book profit on the sale of Sky Radio Group and tax income compared with a tax charge in the previous year. Revenues from B2C subscriptions can be split into revenues from print subscriptions, digital-only subscriptions and combi- subscriptions (both print and digital access). A shift is clearly visible here from print-only to combi-subscriptions, and to a lesser degree to digital-only subscriptions. This shift is largely due to the conversion of print-only subscriptions into combi-subscriptions at De Telegraaf, which gives subscribers the benefit of automatic access to premium content and the digital news archive. This is part of the policy to stimulate subscribers to make more use of our content. The decline in subscription revenues is mainly visible at De Telegraaf; the regional dailies show a slight decline of 0.7%. Revenues from single-copy sales (print) show a slight decline. This concerns a decline at De Telegraaf that is almost entirely set off by an increase in the single-copy sales at Keesing Media Group (+3.2%). Other revenues from B2C transactions rose from € 21.1 million to € 22.7 million, an increase of 7.6%. In 2016, of this revenue flow, € 21.8 million concerned e-commerce revenues. The increase is driven by growing revenues at GroupDeal. Advertising revenues excluding normalisations, consisting of revenues from print and digital advertising, decreased due to a market-wide trend of lower advertising revenues, particularly from print.This development primarily affected De Telegraaf and Metro and, to a lesser degree, the regional titles. Revenue from digital advertisements decreased slightly, mainly due to a shift from desktop (i.e. www.telegraaf.nl) to mobile (De Telegraaf app), for which lower rates apply. Advertising revenues from the discontinued activities of Dichtbij.nl, the collaboration with DUIC in Rotterdam and Utrecht, and the Sunday newspapers have been included under normalisations. Other revenues decreased from € 11.0 million in 2015 to € 10.0 million in 2016. This decrease is due to lower revenues from video productions, mainly as a resut of the cessation of the production of Vandaag de Dag, and a lower book profit on the sale of buildings, and was set off, in part, by the revenue generated by the FashionWeek event. These concern activities that were discontinued in 2015 or 2016 and which are presented separately for the benefit of a representative comparison. The revenues here concern the categories B2B advertising (2016: € 2.4 million, 2015: € 7.9 million) and production (2016: € 0.3 million, 2015: € 3.9 million). The activities in collaboration with 'De Utrechtse Internet Courant' in Rotterdam and Utrecht were partly discontinued at the end of July due to disappointing results. The Rotterdam print edition was taken off the market, while in close collaboration with METRO, the digital activities in Rotterdam were continued. In addition, at the end of 2015, the activities of Dichtbij.nl were partly suspended and at the end of 2016, it was decided to discontinue all its activities. And finally, following the reduction in the number of printing presses announced in 2015, in early 2016, commercial printing activities for third parties were discontinued. In 2015, the revenues from production for third parties still amounted to € 3.9 million (2016: € 0.3 million). Operating expenses before depreciation, amortisation and impairment losses decreased by € 32.7 million. Excluding a lower restructuring charge of € 14.0 million, operating expenses decreased by € 18.7 million. This means that TMG is on schedule with respect to achieving its objective to have reduced its costs by € 90 million in 2019 compared to 2015, excluding the effect of cost increases as a result of new initiatives. In connection with achieving this objective, the restructuring of the printing plants and editorial board of TMG Landelijke Media was completed in 2016 and several processes were optimised. The restructuring of the sales and marketing departments of TMG Landelijke Media and Holland Media Combinatie and the editorial board of Holland Media Combinatie was announced at the end of 2016, just like the combination of TMG Landelijke Media and Holland Media Combinatie at the Basisweg location in Amsterdam. The costs of raw materials and consumables decreased by € 8.2 million. This decline is mainly due to lower newspaper circulations and the more or less complete discontinuation of commercial printing for third parties following the closure of printing plants. The decline in transport and distribution costs was mainly due to lower newspaper circulations and optimisations implemented during the year. The costs of outsourced work and technical production increased mainly because part of the print run was printed externally after six printing presses had been discontinued. The savings achieved as a result of this shift are reflected in lower personnel costs and partly in the lower costs of raw materials and consumables. Personnel costs decreased by € 18.9 million in 2016. Excluding restructuring charges (2016: € 13.0 million, 2015: € 27.0 million), personnel costs decreased by € 4.9 million. Wages and social charges decreased by € 11.9 million. This decrease is mainly due to the reorganisations. Pension costs increased by € 1.2 million, due to a one-off gain in 2015 of € 2.4 million related to the phasing out of the contribution to medical expenses of retirees. Other personnel costs increased by € 5.8 million. This mainly concerns an increase in the costs of temporary staff due to various projects that were initiated, including Telegraaf VNDG and TMG Data Platform. In addition, costs increased due to vacancies being filled by temporary staff. The average number of FTEs decreased from 2,023 in 2015 to 1,790 in 2016. This decline was particularly visible at TMG Landelijke Media following the reorganisation of the editorial board at De Telegraaf and at Facilitating Services following the reorganisation of the printing plants. The restructuring charges of € 13.0 million mainly relate to reorganisations at Sales & Marketing following the combination of TMG Landelijke Media and Holland Media Combinatie and to the reorganisation of the editorial board at Holland Media Combinatie. The decline in sales costs by € 2.7 million is mainly due to fewer marketing partnerships, lower subscriber recruitment costs and lower expenses relating to events (e.g., Sail in 2015). Other operating expenses have decreased by € 6.7 million. This decline is mainly due to the release from the provision for legal disputes, a decline in housing costs following the closure of the printing plants, as well as lower automation costs. The latter relates in part to the transition to new workstations and the insourcing of IT management, which has led to lower external IT management costs. EBITDA increased from € 7.7 million to € 9.0 million. Excluding restructuring charges, EBITDA decreased by € 12.7 million, from € 34.7 million to € 22.0 million. Further details on the EBITDA development of the business units TMG Landelijke Media, TMG Digital, Holland Media Combinatie and Keesing Media Group have been included in separate sections per business unit. Facilitating Services shows a strong improvement of EBITDA by € 20.2 million thanks to the continuous implementation of efficiency and operational excellence measures. Of the EBITDA improvement realised, € 27.8 million was thanks to lower personnel costs, of which € 17.2 million lower restructuring charges. The completion of the reorganisation at the printing plants has contributed to a large extent to the decrease in personnel costs. This decline is offset by an increase in the costs of outsourced work by € 7.1 million and the loss of revenues from printing work for third parties, resulting in a decline of € 3.6 million. The other operating expenses at Facilitating Services also decreased, by € 2.4 million, mainly due to lower lease costs following the reorganisations and due to lower energy, rental, maintenance and distribution costs. The Real Estate team is also working on the sale of regional buildings (the old HMC headoffices and the adjacent printing offices in Alkmaar), and is exploring sale and lease back scenarios for housing in Amsterdam. The increase in the costs of Head Office & Other, which includes the central IT department, was mainly due to higher personnel costs. This mainly concerns an increase in temporary staff for the benefit of various ongoing strategic projects, including the video platform Telegraaf VNDG, the TMG Data Platform and the supervision of various reorganisations. In addition, the 2015 figures include a one-off gain of € 2.4 million related to the phasing out of the contribution to medical expenses of retirees. The business units Facilitating Services and Head Office & Other more or less fully support the business units TMG Landelijke Media and Holland Media Combinatie and, to a lesser degree, TMG Digital and Keesing Media Group. As the passing on of charges was discontinued in 2015, the results of the business units Facilitating Services and Head Office & Other were strongly negative. The segment structure was revised with effect from 2016. TMG Digital, which was part of TMG Landelijke Media until 2016, is now managed as a separate segment. In addition, the IT departments and activities of the various segments have been centralised in the Head Office segment. The comparative figures for 2015 have been restated. Depreciation and amortisation were € 15.1 million, compared to € 17.6 million in 2015. The decline is mainly due to the fact that in 2015, a catch-up depreciation was included of € 1.5 million on the assets of Relatieplanet, due to the reclassification of Relatieplanet from ‘assets and liabilities held for sale’ to ‘continued operations’. In addition, depreciation and amortisation decreased because some assets were fully depreciated, and because buildings were classified as 'held for sale' in 2016, as a result of which depreciation was discontinued. Impairments amounted to € 2.3 million, of which € 2.1 million relates to a downward revaluation of buildings and land, for which offers were received that were below the carrying amount. In 2015, impairments amounted to € 6.8 million and related to a downward revaluation of printing presses and buildings in connection with the decision to reduce printing capacity. On balance, financial income and expenses in 2016 were nil (2015: € 1.0 million negative). This result includes a result from participations of € 0.7 million, which mainly concerns the share of TMG in the result of Radio Newco B.V. relating to the fourth quarter of 2016. Interest charges amounted to € 0.9 million and mainly concerned interest paid on the current account facility. The result from discontinued business operations of € 7.4 million (2015: loss of € 4.0 million) includes both the transaction result on the sale of Sky Radio Group (€ 4.3 million) and the regular result for the period 1 January 2016 up to and including 30 September 2016. The regular net result amounted to a profit of € 3.1 million (2015: loss of € 4.0 million). This improvement was mainly due to the lower costs of depreciation following the discontinuation of depreciation following the classification of Sky Radio Group as 'held for sale'. The share of TMG in the new radio company Radio Newco B.V. was 22.85% when the agreement was entered into. By partly financing the takeover of RadioCorp B.V. by Radio Newco B.V. with shares, this interest was diluted to 22%. After realisation of part of the additional earn-out agreements, an extra 1% share in the new radio company can be acquired, which will eventually bring TMG's interest up to 23%. Income tax amounted to a credit balance of € 2.6 million for 2016 (2015: debit balance of € 1.9 million), mainly due to an addition to the tax-deductible loss as a result of the tax loss in 2016 of the fiscal unity in the Netherlands. The income tax paid in 2016 amounted to € 6.1 million (2015: € 5.0 million) and mainly concerned income tax paid in France and Belgium, where the activities of Keesing Media Group are profitable. The tax-deductible losses as at 31 December 2016 amounted to € 161.7 million (2015: € 111.4 million) and are mainly related to the Dutch fiscal unity. The balance increase is due, on the one hand, to losses of the Dutch fiscal unity in 2016 (due in part to restructuring provisions taken), and, on the other hand, to the elimination of the temporary difference on the restructuring provision. Up to 2016, restructuring charges were taken as a tax loss at the moment of payment. In 2016, the tax treatment was aligned with the commercial treatment of the restructuring provisions. In the coming years, TMG is expecting to generate sufficient taxable profit to compensate the tax-deductible losses and therefore takes a full-valuation approach with regard to these losses (€ 40.4 million). A part of the losses carried forward can be compensated by the possible sale and lease-back of buildings and sites in Amsterdam, as well as by the contribution to the result of various commercial initiatives (such as the online video platform Telegraaf VNDG), cost-saving measures and the sale of regional real estate. The net result for the year was € 1.6 million (2015: € 23.6 million loss). The improvement is mainly attributable to the previously mentioned lower restructuring charges, a lower impairment of non-current assets, the book profit on the sale of Sky Radio Group and a tax income compared to a tax charge in the previous year. The balance sheet total strongly decreased by € 48.9 million, mainly due to the deconsolidation of Sky Radio Group. As a result, the solvency ratio, calculated as the percentage of the equity (attributable to shareholders of Telegraaf Media Groep N.V.) of the balance sheet total, improved from 52.7% to 57.3%. Working capital (i.e., current assets excluding cash and assets held for sale less the short-term liabilities, excluding interest-bearing loans and borrowings and liabilities held for sale) decreased from € 93.0 million negative to € 89.1 million negative, due to a decrease in short-term provisions of € 20.1 million. However, the accounts payable and other current liabilities as at 31 December 2016 include a liability relating to the new value determined for the Radio Veronica licence of € 14.7 million (31 December 2015: nil). At the end of 2016, licence terms already paid were paid back by the Ministry (€ 15.0 million including interest), and an invoice was received for the new value of the licence (€ 14.7 million including interest), which was paid at the beginning of 2017. TMG has appealed against the new value determined by the Minister, and will also appeal against the interest decision. Net cash flow from operating activities in 2016 amounted to € 2.8 million negative compared to € 16.3 million positive in 2015. This decrease was mainly due to higher restructuring charges paid (€ 9.2 million more than in 2015) and a decline in EBITDA (excluding restructuring charges) by € 12.7 million. This was partly offset by a stronger improvement in working capital in 2016 than in 2015. The improvement in 2016 can be attributed to the receipt of the terms already paid for the Radio Veronica licence in 2016. The working capital improvement in 2015 was mainly related to the reduction of stocks of raw materials and consumables by € 4.8 million. Cash flow from investing activities amounted to € 6.2 million negative (2015: € 10.1 million negative). Here a shift is clearly visible from investments in tangible fixed assets, such as buildings and printing presses, to investments in intangible fixed assets, such as the development of websites and apps and software for business applications and IT infrastructure. The cash flow from investing activities in 2016 included the proceeds from the sale of buildings of € 5.1 million (2015: € 1.4 million) and an interim dividend payment received from the participation in Radio Newco B.V. of € 1.1 million. Cash flow from financing activities amounted to € 14.4 million negative (2015: € 5.6 million negative). This includes a payment of dividend of € 7.4 million (2015: nil), the purchase of the shares in Sienna Holding B.V. that were not yet held by TMG for € 5.7 million (2015: nil) and the payment of the annual FM licence to the Telecom Agency by Sky Radio Group with regard to Lot A1 (€ 4.3 million). In addition, in 2016, € 5.0 million was drawn on the current account facility. On balance, the cash flow in 2016 was € 23.4 million negative (2015: € 0.6 million positive), mainly due to the significant payments relating to restructuring charges of € 29.9 million, and the high negative cash flow from financing activities, partly due to the payment of dividend. A letter of intent was signed at the end of December 2016 to amend certain points of the €70 million revolving credit facility agreed with a consortium of two banks in July 2015. The amendments were made in part to allow a possible sale and leaseback of property and are chiefly the extension of the facility by 20 months to 10 March 2020, the reduction of the maximum amount that can be drawn to €50 million and the provision of collateral such as pledges of receivables, IP rights and shares in Keesing Media Group B.V. and a positive mortgage pledge on certain properties. The facility will be reduced to € 30 million after a possible sale and leaseback has been completed. On 13 March 2017, all the conditions for entering into the loan agreement have been met and the amendments have been realised. Until this date (and at 31 December 2016), the terms and conditions agreed in July 2015 remained in force. At the end of 2016, € 5 million was drawn on the facility. The conditions imposed by the banks were met as at 31 December 2016 . It is proposed that the result for 2016 will be added to the reserves and that no dividend will be paid. TMG-wide, 2017 will be characterised by an unabated focus on digital renewal and growth and a further optimisation of our print activities. The foundation for this was laid in 2016. We will continue to develop apps and improve the websites of our main brands. The growth of a number of sites will be accelerated, through collaborations or acquisitions. Furthermore, focus areas are the application of data and the expansion of e-commerce-activities, as well as combining these successfully with publishing activities, in order to enrich content. Further efficiency improvement remains high on the agenda. The activities of TMG Landelijke Media and Holland Media Combinatie were combined in Amsterdam at the end of 2016. It is expected that the restructuring of the sales and marketing departments of these entities as well as the restructuring of the editorial board of Holland Media Combinatie will be completed in 2017. In accordance with the announcement of 23 March 2017, the insufficiently profitable weekly magazines will be sold in 2017.These measures that will be implemented in 2017 are a further step towards achievig the cost reduction objective. This outlook relates to the situation as it stands at the moment of publication of the annual report and the financial statements. TMG, Mediahuis and VP Exploitatie entered into a conditional agreement on 5 March 2017 in connection with the proposed bid by Mediahuis and VP Exploitatie for TMG. Mediahuis and VP Exploitatie have submitted a bid notice for approval by the Netherlands Authority for the Financial Markets on 8 March 2017. The bid will be made by publishing the approved bid notice. The bid will be conditional on certain requirements being met. TMG will announce its position with respect to the bid in a reasoned submission during an Extraordinary General Meeting of Shareholders in connection with the bid, that will be combined with the Annual General Meeting of Shareholders on 1 June 2017. It is expected that the bid will be finalised in the second or third quarter of 2017. In connection with the conditional agreement that TMG, Mediahuis and VP Exploitatie entered into on 5 March 2017,Talpa Beheer B.V. and Dasym Investments II B.V. applied to the Enterprise Chamber of the Amsterdam Court to take immediate relief measures, to institute an investigation into the course of events at TMG and to appoint an independent supervisory director. The Enterprise Chamber made a provisional judgement on 21 March 2017, ruling that there were no valid grounds to doubt proper policy-making or the course of events at TMG. It dismissed all requests to impose immediate measures. The request submitted by the suspended members of the Executive Board of TMG to lift their suspension was also dismissed by the Enterprise Chamber. The date of the session during which the request to order an inquiry will be addressed, has not yet been determined. On 14 March 2017, the Supervisory Board appointed Mr Hans Bakker as interim Executive Director of TMG with immediate effect. In this position, Mr Bakker will be responsible for the daily management of the company. He will continue to hold this position until a new Executive Board has been appointed. With strong brands such as De Telegraaf, Privé, VROUW, Autovisie, DFT, Telesport and Metro, TMG Landelijke Media offers digital, printed and cross-media content, with a focus on news, business, entertainment, sports and lifestyle. High-quality content and a large national multi-media reach make each of these brands an attractive partner for advertisers and content makers. At year-end 2016, the total number of TMG Landelijke Media's employees (FTEs) was 498. The head office is located in Amsterdam. Revenues were down from € 222.8 million in 2015 to € 201.9 million in 2016 (down 9.4%). This was mainly due to the decline in traditional revenue from print activities. Thanks to a strong decrease in costs, the decline of EBITDA was limited to € 8.9 million. Excluding restructuring charges, EBITDA decreased by € 14.1 million. Revenues from B2C subscriptio ns have decreased by € 5.1 million (down 4.1%), especially at De Telegraaf. Here we clearly saw a shift from print-only subscriptions to combi-subscriptions (both print and digital access) and to a lesser degree to digital-only subscriptions. The combi-subscriptions (access to print and digital) showed an increase of € 28.4 million (up 92.2%). This was mainly due to the transition from fixed print-only subscriptions to combi-subscriptions. At De Telegraaf, the weighted average number of fixed subscriptions decreased by 7.4% (2015: down 5.5%). Revenues from B2C transactions, mainly consisting of revenues from single-copy sales, showed a decline of € 2.4 million (down 9.6%). This decline was visible both in the Netherlands and abroad and more or less the same as last year. The decline in volume could only partly be offset by higher prices. Revenues from B2B advertisements decreased from € 68.3 million in 2015 to € 55.3 million in 2016, mainly due to the contuining decline in advertising revenues from print as a result of shifts to other media. This development was mainly visible for the titles of De Telegraaf and Metro. Revenues from digital advertising decreased slightly, which was mainly due to a shift from desktop (e.g., www.telegraaf.nl) to mobile (De Telegraaf app), where rates are lower. The number of page views across all channels and brands rose in 2016 by 19%. Other revenues have decreased by € 0.4 million. This concerned a decline due to lower revenues from video productions following the discontinuation of the Vandaag de Dag production. This was partly offset by revenues from events organised by Amsterdam FashionWeek, acquired in 2016. TMG Landelijke Media managed to reduce its operating expenses by € 12.0 million (down 7.4%). Excluding restructuring charges, operating expenses have decreased by € 6.8 million (down 4.5%). The decline was mainly due to lower costs of transportation, distribution and outsourced work (down € 7.4 million) as a result of a lower average circulation and lower costs of paper and ink. Personnel costs also decreased significantly (down € 7.3 million), mainly as a result of restructuring charges being € 5.2 million lower. The other decline in personnel costs concerned a combination of a decline in wages and social charges following a decrease in the average number of FTEs by 75 and an increase in the costs of temporary staff. Other operating expenses increased by € 3.7 million. This was mainly due to costs related to events of the acquired Amsterdam FashionWeek and to the higher consultancy costs related to various strategic projects, including the joining together of the business units TMG Landelijke Media and Holland Media Combinatie. The combined print and online figures issued by NOM (National Multimedia Research) on the second half of 2015 up to and including the first half of 2016 show that the Telegraaf brand is a leader in total brand reach compared to other dailies in the Netherlands. In the period measured, De Telegraaf reached 6,923,000 people. In addition, De Telegraaf achieved 24.4 million1 video views per month, among other things. The other main brands of TMG Landelijke Media also achieved a large total brand reach in 2016. A few examples: in the period measured, VROUW achieved a total reach of 2.6 million, Privé had a total reach of 3.5 million, and Metro a total reach of 6.2 million2. In the year under review, the brands of TMG Landelijke Media have strengthened, mainly due to the improvement of the digital activities. The reorganisations started in 2015 within TMG Landelijke Media were largely completed. The combining of activities with Holland Media Combinatie was prepared and partly implemented, which lays the foundation for further quality improvement and increased efficiency. The Klaus Ross case: a series of impressive revelations of the shadowy world of alternative natural healers who use legal loopholes to rip off desperate patients. A series on the pensions rip-off: a low-threshold, clear explanation of the complex issues surrounding pensions and the negative developments for participants in pension schemes. The 'sorry' interview with the Prime Minister: in 2016, Mark Rutte responded to the promises he made in De Telegraaf in 2012 and in an interview with De Telegraaf he said sorry for the promises he did not keep. Tackling 'bully vloggers' in Zaandam: an agenda-setting series that showed how a small group of bully vloggers managed to hijack and sabotage society − regional news with national impact. A common theme in these and other journalistic products is that De Telegraaf presents things from the perspective of the reader, questioning malpractices and showing the impact on society. For more information, please see the chapter "The power of our journalism". The advertising campaign ‘Altijd vanuit het hart’ (‘Always from the heart') kicked off on 18 November, with the aim of attracting new subscribers by emphasising De Telegraaf's unique power. This campaign shows in 30-second-commercials what De Telegraaf stands for as a brand. The online campaign 'Het verhaal achter ons nieuws' ('The story behind our news') that kicked off in 2016 is reaching a large audience. In online videos, viewers get a glimpse behind the scenes in the newsroom and learn what the profession of journalism involves. Various editors and journalists explain how the news that appears in the paper is made. On Telegraaf.nl there were on average 5,000 views per episode. On YouTube, some of the 'mini documentaries' were viewed more than 350,000 times. In 2016, De Telegraaf launched its new Saturday magazine VRIJ, which replaces the 'Weekeinde' and 'Reizen/Varen/Wonen' sections. After the launch, a readers' survey was held, on the basis of which the content was brought more in line with subscribers' expectations. Metro's monthly supplement 'Mode' was renewed: the first 'Metro Lifestyle' came out in May 2016. In 2016, the development of Telegraaf VNDG was put forward: a 24/7 online video channel, with a mix of news, sports and entertainment, from a typical Telegraaf world view. The main set-up of the website of De Telegraaf was improved in 2016. The number of video positions was expanded and visually better aligned with the general look and feel of the newspaper. In December 2016, a start was made on the second phase: the complete overhaul of De Telegraaf's digital portfolio, particularly the website. Besides a far-reaching re-design and a significant improvement of ease of use, new consumer propositions will be launched. In October, the new website of Telesport was launched: telesport.nl, suitable for mobile, tablet and desktop. The website is based on the editorial pillars of football, Formula 1 and motorsport, bicycle racing, skating, tennis and darts, and is dedicated 24/7 to top-level sports news, backgrounds and statistics. The website offers a lot of video, in addition to written content offering more in-depth background stories. Logged-in users have access to premium content. De Financiële Telegraaf (DFT) launched a whole new knowledge website, dftkennis.nl, developed together with knowledge partners such as SingularityU The Netherlands and Nyenrode Business University. In addition, DFT launched a new app for the latest stock market and business news. At the end of October, Privé launched a multi-platform app that gives subscribers 24/7 access to Privé's latest showbiz and entertainment news. In addition, in early October, the first edition of Privé's new royal family special was launched: Privé-Royal. In early 2016, the new website of VROUW was successfully launched. After three months, the website had 2.1 million unique users. Up to and including December 2016, the average number of unique visitors per month was 1.8 million3. Besides reach, the focus was on engagement, both on VROUW's own platform and on social media, as well as on expanding commercial propositions. During the year, various new features were added, such as an online payment module, which makes it easy for consumers to pay for products and services (e.g., to participate in challenges) within the VROUW environment. Metro performed well on social media. In 2016, the number of Facebook 'likes' for Metro Holland increased by 82,000 to more than 344,000. The Instagram account grew from 5,000 to almost 17,000 followers. In addition, Metro was mentioned in various leading rankings of brands that understand how you should use Snapchat. The number of views per Snapchat story rose explosively last year. The acquisition of Amsterdam FashionWeek strengthened the brand portfolio, content and reach of TMG. Twice a year, the trend-setting live highlight takes place: the Mercedes-Benz FashionWeek, the ultimate platform for the Dutch and Flemish fashion industry. One of the first spin-offs of the takeover is the completely renewed online platform Fashionweek.nl, which was officially launched at the end of November 2016. This platform offers advertisers an opportunity to reach their target groups not just around and during the event, but 365 days a year, for example, through native content. In addition, FashionWeek's presence on social media was activated, showing impressive growth figures. At the beginning of 2016, TMG Natives was launched, a new department that develops creative content and concepts for customers' marketing and communication issues. On the basis of an ingenious strategy, conversion targets, a creative concept and in-depth target group analyses, TMG Natives produces content, if desired in close collaboration with Data Platform TMG Datalab. The content tells stories that enhance consumers' engagement with the brand, optimising the balance between the communication need from the customer's point of view and the added value of the content for the consumer. As part of TMG, if desired, TMG Natives can deploy a broad brand package, such as VROUW, Metro, DFT.nl, Autovisie, Dumpert.nl, and Amsterdam Fashionweek, through all possible channels. With this new service, TMG competes with independent content marketing agencies, distinguishing itself with the very strong benefit of the millions reached by TMG's brands. TMG Datalab is the new point of contact for advertisers and media agencies that focuses on achieving maximum conversion on the basis of data. Through the intensive use of the platforms of all our brands, TMG has access to a wealth of data. These data give insight into consumers' interests and preferences. By combining data with information from various external sources (e.g., social-demographic data and data generated by social media networks such as Facebook), we can create more specific and richer segments. TMG Datalab's data analysts, data scientists, developers and marketeers help advertisers to increase their impact and return on investment and to identify new opportunities. Name and address details of consumers are never passed on to advertisers. The data made available to advertisers can never be traced back to an identified or identifiable person. The reorganisation of the editorial board of De Telegraaf and its sub-brands that was started in 2015 was completed in 2016. The competencies of the editorial board have been further aligned with the digitalisation of the news offer. In order to be able to leverage topical occurrences even more directly, a ‘hit & run’ editorial board was set up. This team is mainly concerned with big and small news events in the country: from a terrorist threat at Schiphol to the massive interest in rutting deer in the Veluwe nature reserve. The implementation of the central editorial system CCI Newsgate has been completed. The magazines of TMG Landelijke Media now also make use of this. Editorial boards can work more efficiently thanks to the new system; it has become easier to use the same content on different platforms. Reactivating former subscribers and activating new subscribers with new propositions, including digital. Retaining and digitalising existing subscribers can be achieved by adding value and 'stacking' propositions, such as by adding extra supplements to the newspaper or the weekend edition. The longer a subscriber has been a customer and the more they buy, the higher the discount and the number of extras. As a result of the more and more personal approach, for example through VIP subscriptions, combination subscriptions (online and print, national and regional) and member-get-member actions, subscribers will increasingly experience being 'members' of the Telegraaf community. To this end, the subscription systems have been partially modernised in 2016. This proces will be continued after 2016. At the end of 2016, Holland Media Combinatie moved from Alkmaar to Amsterdam, in order to make a next big step in realising the new media ecosystem. The aim is to achieve maximum efficiency and quality improvement in the combined organisations of TMG Landelijke Media and Holland Media Combinatie. Adjustments to the editorial boards and the marketing and sales organisations were announced and initiated in 2016. The sales organisations of TMG Landelijke Media and Holland Media Combinatie were joined together in 2016 and reorganised. A new management team has been appointed, the organisation has been downsized, competencies have been fine-tuned and processes streamlined. For marketing and the editorial organisation, changes were announced at the end of 2016 which will be implemented in 2017. In 2016, TMG Landelijke Media organised various events in order to bring target groups together and to make complex knowledge understandable and accessible to a larger audience. Together with Business University Nyenrode, two series of lectures were set up. In partnership with SingularityU, DFT Kennis organised the successful tech event Get into the Future, where more than 550 participants listened to experts talking about the application of new exponential technologies and were also able to experience the technologies first-hand. In addition, DFT organised a series of online seminars about topical personal finance issues, such as investments, health insurance and pensions. In total, more than 9,000 people logged in to watch the series. Telesport was involved as a media partner in the Amsterdam City Swim, a charity event collecting money for research into underexposed diseases. NS and Metro have started a pilot to stimulate the reuse of newspapers on the train by collecting papers people have finished reading. In September, on the occasion of breast cancer month, the VROUW team created the Pink Ribbon Magazine, with moving and inspiring stories by and for women, as well as items on fashion and personal care. The print run was 75,000 copies; more than 50% of the net results went to Pink Ribbon. In that same month, VROUW organised the VROUW Steps Challenge, aimed at encouraging women to take more exercise. Each participant received access to a personal page on the website. The challenge ran the whole month of October. Halfway through, participants could also join in the Amsterdam City Walk. At the end of 2016, this was followed by the 'Lekker in je vel' challenge. Dumpert, GeenStijl, GroupDeal, Relatieplanet, Gaspedaal and Autobahn are well-known brands of TMG Digital: the business unit that covers all primary online platforms and activities since 1 January 2016 . Besides further developing these platforms, their content and online communities, TMG Digital plays a crucial part in the further digitalisation of TMG's new media ecosystem, as well as in the accelerated development of new business models. At the end of 2016, TMG Digital, located in Amsterdam, had 133 employees (FTEs). Revenues at TMG Digital increased from € 32.9 million in 2015 to € 35.0 million in 2016, an increase of 6.4%. Operating expenses increased by € 1.9 million, as a result of which EBITDA rose by € 0.2 million (+ 7.4%) to € 2.9 million. Revenues from B2C transactions, mainly consisting of e-commerce revenues, rose by € 2.0 million. This concerned GroupDeal revenues, where the average order value per transaction was noticeably higher than in 2015. The increase of € 0.2 million in the revenues from B2B advertisements concerned a combination of a decline in print advertisements at Bohil, due to the focus on online, and an increase in digital advertisements. This increase can mainly be attributed to a better performance at Gaspedaal. The increase in operating expenses were mainly due to higher purchase value of GroupDeal goods and higher personnel costs due to an increase in the number of FTEs. This trend was visible for virtually all parts of TMG Digital. With a variety of titles in its portfolio, TMG Digital has a large reach within several domains. TMG Digital has a significant reach among highly-educated young men, with 150.8 million video views per month on Dumpert and 1.9 million users of Geenstijl per month. On social media, too, Dumpert has a significant position, with 1.6 million likes on Facebook and 1.2 million followers on Instagram. In 2016, the new website Autobahn.eu was added to the automotive domain in the portfolio. At the end of 2016, 1.1 million users per month were visiting this website. Through the e-commerce newsletters of GroupDeal and Telegraaf Aanbiedingen, new offers reach 3.2 million Dutch people every day. With 1 million visitors a month, Gaspedaal has been one of the biggest second-hand car websites in the Netherlands for three years1. In 2016, TMG Digital operated as an independent business unit for the first time. The focus was mainly on identifying synergy opportunities between the various platforms, standardising processes and ways of working, and scaling up the mature platforms. The various titles within TMG Digital started working together more closely in 2016, including Relatieplanet, which moved from Groningen to Amsterdam at the end of 2016. Where possible, synergy advantages are realised, including with regard to sales, online marketing, product development and customer service. In 2016, the website Autobahn.eu was started by Dumpert. At the end of 2016, this website had 1.1 million unique users per month. In collaboration with TMG Landelijke Media, TMG Digital is examining how the three online automotive platforms Gaspedaal.nl, Autobahn.eu and Autovisie.nl can strengthen each other, in terms of content and reach. For example, the two Cars & Coffee automotive events in 2016 were extensively promoted and were very well attended, with 1,000 cars and 4,000 participants. Dumpert.nl – the ultimate brand for young men aged 18 to 35 – is fully committed to mobile, social media and video, and achieved tremendous growth doing so in 2016. In the year under review, a new app was launched (native iOS and Android); this app alone was good for more than 100 million video views per month. On social media the reach of Dumpert.nl rose to 1.6 million likes on Facebook and 1.2 million followers on Instagram. In addition, with DumpertTV, Dumpert.nl launched its own video productions, including the hit ‘Dumpert Reeten’ and ‘Dumpert filmt je werkplek’. With this unique content, in 2016 DumpertTV realised an average of 5 million video plays per month. In the year under review, it became clear that the platforms of TMG Digital are a valuable addition to TMG's brand portfolio and media mix: several Dumpert videos posted by TMG Landelijke Media's advertisers went viral. In 2016, as announced, TMG Digital further scaled up Gaspedaal, Dumpert and GroupDeal. For Gaspedaal, a cost-per-click model was implemented; at the end of 2016, more than 1,400 dealers had joined. With more than 1 million visitors per month, it has been one of the largest second-hand car websites in the Netherlands for three years. Dumpert introduced its own content, including ‘Dumpert filmt je werkplek’. These online video’s were viewed by some 350,000 people per episode. The Dumpert app was renewed and improved. At the end of 2016, the app had, on average, 900,000 users; per month, there are 100 million video views in the app. E-commerce platform GroupDeal achieved sound revenue growth in the Netherlands and Belgium. Back-office processes were improved further. TMG Digital focuses on online publishing (including Dumpert), supply and demand (including Gaspedaal) and e-commerce (GroupDeal). Expertise in these three fields enables TMG to move along the sales funnel and expand its advertising business model based on CPM with, for example, pay per click (CPC), per lead (CPL) or even per transaction (CPS). On video platform Dumpert.nl, a transaction model was implemented in 2016 (DealDumpert), where relevant deals are offered to the target group every day, in a way that fits in with the brand and that appeals to the Dumpert target group. On the basis of this vision, TMG Digital will develop more e-commerce-activities in 2017 using TMG's brands. For this purpose, the GroupDeal infrastructure will be used to process the transactions and to align the e-commerce-propositions seamlessly with each individual brand and its visitors, readers and fans. In December 2016, for the eighth time in a row, Relatieplanet was voted the best website of the year in the Dating category. There were successful ‘offline’ events, including a successful speed dating world record attempt during the renowned four-day walking event in Nijmegen. In the year under review, TMG Digital set up an accelerator process, which enables new and renewed digital concepts to be developed, tested and, if feasible, made ready for launch in just 100 days. TMG Digital has entered into a pilot partnership with Tunga: the first freelance platform in the world set up as a social network. If extra capacity is needed for programming assignments, TMG Digital can hire qualified African programmers through Tunga. In 2016, Tunga's first assignment concerned the new Gaspedaal.nl apps. The test versions of these apps were delivered in 2016 to the full satisfaction of everyone involved. In the first quarter of 2017, they will be completed by Tunga, after which they will be released. Noordhollands Dagblad, Haarlems Dagblad, IJmuider Courant, De Gooi- en Eemlander, Leidsch Dagblad, De Echo and Witte Weekbladen are well-known brands of Holland Media Combinatie, both online and in print. In the provinces of North and South Holland, Flevoland and Utrecht, Holland Media Combinatie publishes a large number of specials and magazines, including the weekend magazines Vrij and PLUS. Holland Media Combinatie also organises regional trade fairs and events. At the end of 2016, Holland Media Combinatie employed 418 FTEs. Total revenues decreased from € 102.3 million in 2015 to € 93.1 million in 2016 (down 9.0%), particularly driven by a decline in advertising revenues from print due to a declining market trend, as well as disappointing results and partial cessation of operations at Dichtbij.nl and the print activities in the Rotterdam/Utrecht area. Operating expenses decreased by € 1.4 million (down 1.9%). Normalised for restructuring costs, however, the decline was € 5.5 million (down 7.5%) resulting in a € 3.7 million lower EBITDA (down 12.8%) excluding restructuring costs. Revenues from B2C subscriptions show a slight decline of € 0.4 million (down 0.7%), with the decline in subscriptions virtually entirely offset by a price increase. The decline in circulation at the regional dailies was between 2.5% and 4.5%, a strong improvement compared to the decline in 2015. Revenues from B2B advertisements decreased by € 9.3 million, which was mainly due to the discontinuation of the aforementioned activities. Excluding the effect thereof, the decline was € 3.8 million (down 10.7%), particularly due to the continuing decline in advertising revenues from print following the shift in advertisers' spend to other media. Revenues from digital advertisements increased significantly (up 75%), although in absolute figures they are still moderate (€ 0.7 million). O perating expenses declined by € 1.4 million in 2016 compared with 2015 as a result of an increase in restructuring cost of € 4.1 million, in combination with a decline of € 5.5 million in other operating expenses compared with 2015. The decline in other operating expenses is mainly attributable to a decline in the costs of transport, distribution and outsourced work by € 3.2 million as a result of lower circulations and portfolio rationalisations. In addition, personnel costs decreased by € 2.3 million due to a decline in the average number of FTEs by 53, mainly due to reorganisations implemented in 2015 at Commerce and Dichtbij.nl. The restructuring costs of € 4.8 million (2015: € 0.7 million) relate to reorganisations of the editorial board and Dichtbij.nl. With its strong and trusted daily newspaper brands, Holland Media Combinatie reaches more than 1.8 million people in the region1. The combined average reach of our print media (regional newpapers and door-to-door papers) is 72% of local, regional residents2. Digital access to our brands is also increasing. On average, the number of pageviews per month of the regional newspapers via the online platforms is nearly 12 million3. The strong brands of Holland Media Combinatie are indispensable to residents in our distribution areas. In 2016, Holland Media Combinatie focused on strengthening successful activities and preparing the combination of activities with TMG Landelijke Media. malpractices in the imposition of sanctions against welfare recipients. Just as the Summer supplement, with its own theme, many articles had a social impact. More about this can be found in the section 'The power of our journalism'. Finally, Holland Media Combinatie entered into a partnership with game platform XGN. This platform enriches the content in the regional dailies, with weekly news about games and gadgets, appealing to a younger target group. The De Gooi- en Eemlander website was completely renewed. The website provides users with a customised online news offer. Registered visitors can enter their personal preferences with regard to the type of news they wish to see. Paying playlist subscribers also have access to selections of articles about specific topics or themes. Alongside the renewed website, which was launched in October 2016, new types of subscriptions are being implemented. The other regional websites will follow this example and will be relaunched in 2017. The pilot with the hyper-local news platform that kicked off in 2015 in Rotterdam and Utrecht was discontinued because it proved less successful than anticipated. On the basis of all digital assets and experiences, a new concept was developed. At a relatively low cost, the new hyper-local apps have now been launched for Amsterdam, Almere, Alkmaar and Leiden. Other cities will follow in 2017. To find content and create awareness, associations, companies, municipalities and educational institutions in the regions are approached proactively. Due to disappointing results, all activities of Dichtbij were discontinued in 2016, thus eliminating the negative effect of these activities on the result as of 2017. This type of news provision is continued though the local and hyper-local (digital) initiatives within the main brands. In the context of the further implementation of the TMG media ecosystem and the creation of an agile organisation, in mid 2016, it was announced that the activities of Holland Media Combinatie will be combined with those of TMG Landelijke Media. The employees of the HMC head office in Alkmaar moved to Amsterdam in December. The sales organisation of HMC has been combined with the sales team of TMG Landelijke Media, and changes in the editorial and marketing organisation of HMC have been announced. The building at the Edisonweg in Alkmaar is no longer used and has been offered for sale. As of 1 January 2016, Koninklijke BDU, NDC mediagroep, Media Groep Limburg and Holland Media Combinatie have a single point of contact for the national advertising market for regional dailies and door-to-door papers: ProMille Media. ProMille Media offers advertisers the convenience and the expertise to achieve the best results with regional and local target groups. The sales team of ProMille Media was brought up to strength in 2016. Besides print advertisements, as of 2017, ProMille Media will be marketing the digital reach of the partners. In the Adformatie Christmas Report 2016, advertisers and media agencies voted Holland Media Combinatie the No. 1 media operator in the field of door-to-door papers, and No. 2 in the field of daily newspapers, following on the heels of Persgroep. All account managers of Holland Media Combinatie followed various online sales training programs to align their competencies with the TMG strategy and improve their commercial results. In 2016, Holland Media Combinatie became media partner of the Dam tot Dam Weekend. With 85,000 participants, this is the largest sports event in the world. A large part of the participants and visitors are from the province of North Holland: the heart of Holland Media Combinatie's distribution area. Via print and online, these people are now even more closely involved in this sports event and the HMC brands in this area. Denksport, 10 voor Taal, Jan Meulendijks, Win!, Sport Cérébral, Megastar and Tankesport are the strong brands of Keesing Media Group, publisher of puzzle magazines and digital puzzles. Keesing Media Group is active in the Netherlands, Belgium, France, Denmark, Sweden, Germany, Spain, Norway, the United Kingdom, Hungary and Italy . At the end of 2016, Keesing Media Group employed 272 FTEs. The head office is located on Basisweg in Amsterdam. In 2016, revenues at Keesing Media Group increased by € 2.0 million (+2.8%). With operating expenses increasing by € 1.1 million, this resulted in an increase in EBITDA of € 0.9 million (+ 4.4%). Excluding restructuring costs, the increase was € 1.1 million (+ 5.2%). The increase in revenues was fully attributable to higher revenues from B2C transactions, consisting of single-copy sales of puzzle magazines. This increase is mainly due to expansion of the product portfolio, such as the introduction of puzzle booklets for children in collaboration with Viacom. The increase in operating expenses was mainly due to an increase in personnel costs by € 1.2 million due to an increase in the number of FTEs. In addition, the costs of temporary staff were higher due to vacancies being filled by temporary staff. Restructuring costs were € 0.6 million, an increase of € 0.2 million compared to 2015. With its range of digital and print brands, including the Denksport volume of 16 million in the Netherlands and Belgium and the Megastar volume of 42 milllion in France, Belgium, Germany, Italy, Spain, Austria and Switzerland, Keesing Media Group is market leader in the European puzzle market. In France, the puzzle market declined slightly in 2016. Revenues and market share of the brands Sport Cérébral and Megastar both grew. In the Netherlands, revenues also declined slightly; by publishing more issues, the decline in average sales could be partly offset. In Belgium and Germany, Keesing Media Group realised more revenue growth thanks to the growth in the number of issues. The activities in Spain grew strongly, mainly due to growth in the number of issues, but also due to the expansion of sales and promotion activities. In Denmark and Sweden, revenues grew despite a decline in the number of issues, thanks to adjustments in the product portfolio, with successful new titles being launched to replace titles that performed less well. In Italy, the portfolio of colouring books was optimised and the portfolio was expanded by adding Sudoku titles. a new retail strategy with more focus on new channels. In Spain, Keesing Media Group achieved further revenue growth and market share growth. This was driven by better conditions with respect to distribution, the expansion of the sales force, and promotion and expansion activities relating to the product portfolio. Thanks to portfolio adjustments, further growth was also achieved in Germany and Sweden. In Norway, Keesing Media Group switched to a different distributor, which provides a good basis for further growth. In Italy, the portfolio was expanded by adding Sudoku titles and promotion activities were tested. In Hungary, a start was made on a collaboration with regard to colouring book and Sudoku titles. In 2015, Keesing Media Group started a collaboration with Eye to Eye Puzzles in the UK. In 2016, this collaboration was given more structural shape by Keesing Media Group taking a 39.3% minority interest in Eye to Eye Puzzles ltd. In 2016, besides the existing tablet apps, Keesing Media Group launched various apps for mobile. The offer currently consists of apps for Sudoku, Tectonic, Woordzoekers and Kruiswoord on mobile devices. This is besides the digital puzzles that are available to B2B customers. In that field, too, there have been developments, for example by making these puzzles responsive for various devices. It is expected that these innovations will lead to revenue growth in the coming years. In 2016, some 200 new titles were launched in 11 countries in total, not just in the ‘new’ countries, such as Italy, Hungary and the UK, but also in existing markets. The focus here is on growth in the children's segment. For new children's titles, Keesing Media Group has entered into a partnership with Viacom, known for brands such as Dora, Spongebob and Teenage Mutant Ninja Turtles. In the year under review, important steps have been taken to further improve efficiency in the core countries (France, the Netherlands, Belgium and Denmark). In France, the process of puzzle production was further automated. In the Netherlands, customer service was insourced as of September, to increase the quality of customers contacts. In Denmark, a switch was made to a different distributor, mainly in order to further increase the availability of titles. The main processes within Keesing Media Group were further streamlined and harmonised, mainly with a view to improving the efficiency and scalability of the organisation, as well as the possible expansion of activities in Europe. In addition, a reorganisation was implemented whereby the organisation was adjusted from a smart matrix structure into a functional structure, with the aim of realising more synergies between the countries. In order to increase collaboration and knowledge sharing, various international consultation structures were set up. This has resulted in, among other things, a new retail strategy. The number of FTEs was reduced. The senior management team was made smaller. The TMG culture programme was continued, with a particular focus on strengthening the second management layer, to increase decisiveness. Keesing Media Group donated 50,000 colouring and puzzle books in Dutch, French and English to the Dutch Central Agency for the Reception of Asylum Seekers (COA), in order to provide people in the reception centres with some relaxing entertainment. Together with Hersenstichting, Denksport published a booklet: Hersencoach (Brain Coach). Of each copy sold, 50 cents go to Hersenstichting. TMG aims to optimally inform investors about its strategy, activities and financial position. In order to further improve its Investor Relations policy, in the course of 2016, TMG had a perception study carried out by a specialised external party. As part of this study, feedback received in personal meetings with investors was analysed. The results of the study will be used in the coming years to add to and improve the IR policy. As a direct result of this perception study, in 2016 TMG organised a dialogue meeting on Corporate Social Responsibility. In addition, on 27 September, an Investor Relations Day was organised for sell-side analysts and institutional investors. During this day, TMG's strategy and outlook for the coming three years was explained further and discussed. This Investor Relations Day could also be followed via an audio webcast. In addition, TMG held an information meeting for members of the Dutch Investors' Association VEB. During the year, investors were kept up to date as much as possible about strategic and other developments through press releases, the semi-annual and annual reports, and the corporate website. The information provided included results achieved, new strategic partnerships, developments at our brands, and adjustments made to our organisation. On our corporate website www.tmg.nl all public information can be found with respect to our strategy, performance and activities. When the Executive Board holds a presentation for analysts, investors and other interested parties, such as on the occasion of the publication of the (semi) annual accounts, this presentation will be audio or video broadcast live on this website. The audio and videocasts and associated presentations can also be consulted after the event, and a replay of the audio webcasts is available. During the Investor Relations Day on 27 September 2016, TMG gave an update on its 24/7 strategy and presented the outlook up to and including 2019. In addition, the Executive Board presented the progress made with regard to the organisational adjustments that had been announced when the semi-annual results were published in July 2016. The 24/7 strategy focuses on creating and distributing relevant content for all consumers in the way they prefer (anywhere, always, via all possible forms of distribution) and on further increasing the reach of the most important brands of TMG, making use of all available data. The roll-out of this strategy follows a strict time line and is a continuous process. This will enable us to adjust to an ever changing media and consumer market in the Netherlands. TMG carries out its strategy on the basis of three pillars: focus, recovery of core activities and making the organisation future-proof. Continuing EBIT margin1double digit (1.3% in 2015, >4% in 2017, >10% in 2019). Reduction of costs by € 90 million (2017 € 40 million)2. Growth of the share of digital in total revenues of >25% (13% in 2015, >16% in 2017). Recovery of the dividend payment percentage of 35% of the operational cash flow. TMG is listed on the Euronext Amsterdam stock exchange and is part of the small-cap index (AScX). As at 31 December 2016, TMG's issued and paid-up share capital consisted of 46,350,000 ordinary shares and 960 priority shares, with a collective market value of € 220.16 million. The number of ordinary shares remained unchanged in 2016. The ISIN code is NL0000386605. For an overview of all outstanding and potentially available defensive measures, see ‘TMG Preference Shares Trust’ and ‘TMG Priority Share Management Trust’ under Corporate Governance. The TMG share closed the year at a price of € 4.75. This was 27% higher than the share price on 31 December 2015 (€ 3.75). The total volume traded of the TMG share on Euronext Amsterdam in 2016 was 16.5% higher than in 2015. 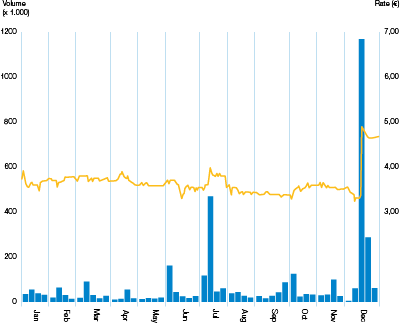 On 14 December 2016, the highest closing price of 2016 was reached: € 5.00. This was the day on which the receipt of the first bid from Mediahuis and VP Exploitatie was announced. Regarding the dividend policy, it was determined in 2014 that the payment of dividend was made dependent on the normalised operating cash flow, i.e., normalised EBITDA of total operations (continued operations and discontinued operations in the year) subject to the deduction of the annual licence fees owed by Sky Radio Group, taxes, interest and replacement investments. The basic principle is a payout of 30%–40% of this net operating cash flow. Operating result (excluding the operating result from discontinued operations) corrected for restructuring charges, excluding one-time expenses and including the result from associates, as a percentage of revenue. Excluding the effect of increases in costs resulting from new initiatives.